es•sence (’esəns), n.: that quality which constitutes or marks the true nature of anything. What qualities mark the true nature of a perfect protein powder? We asked this question when developing Essence™. We realized rather quickly that run-of-the-mill protein powders could never measure up to the true nature of a perfect protein powder. Those “ordinary” protein powders contain only one source of low-quality protein, clump when stirred into liquid, contain a ton of fat and sugar, taste terrible and produce a chalky or gritty mouthfeel. On the other hand, the qualities of a perfect protein powder are instant and complete spoon mixability in liquid, a combination of several high-quality protein isolates, zero sugar, zero fat, and a taste and mouthfeel which can only be described as heavenly. Essence™ is a precise, engineered blend of the highest-quality isolated proteins. Although more expensive than protein concentrates, protein isolates are a minimum of 90% protein and have zero fat and zero carbohydrates. They are considered the luxury proteins and have a refined taste and color profile. Indeed, there are several very high-quality protein sources such as soy, casein and whey; however, none of them are perfect in every aspect. All of these protein sources are equal in terms of overall health and growth of lean body tissue, but each has their specific physiological strengths and weaknesses. For instance, soy protein isolate has been shown in several published studies to be at least as good as, if not better than, whey and casein in terms of lean body mass growth. Furthermore, it outshines every other protein source in terms of its cholesterol lowering and kidney protecting abilities. Whey protein isolate, on the other hand, has been shown to be the fastest metabolized protein source and to have superior immune-stimulating abilities. Casein has been shown to be the slowest metabolized protein source, which makes it superior for providing muscle tissue with amino acids over an extended period of time. Thus, even though ingesting one protein source has many benefits, ultimately the best course of action is to consume several high-quality protein sources in order to minimize the weaknesses and maximize the strengths of each source. Not at all! In fact, soy protein is known for balancing hormone levels. In many instances, it can reduce the effects of excessive estrogen and bring the hormonal picture back into proper perspective. Not at all—another urban legend! The studies show just the opposite. Soy protein has been shown time and again to not only have an inherent slimming effect but to have no deleterious effect on the thyroid gland. Yes! The amino acid profile of Essence™ is better than any protein on the market. Furthermore, because it provides the unique benefits of three different protein isolates, it offers the best opportunity for increasing overall health and well-being . . . from increasing lean body mass to decreasing fat stores, to increasing antioxidant status, to increasing the immune system, to protecting the kidneys, etc, etc. Because it contains proteins which are metabolized both quickly and slowly, it is an ideal protein source for any time of the day. Some people will consume a fast-acting protein source, like whey protein, after a workout and consume a slow-acting protein source, like casein, before bedtime. 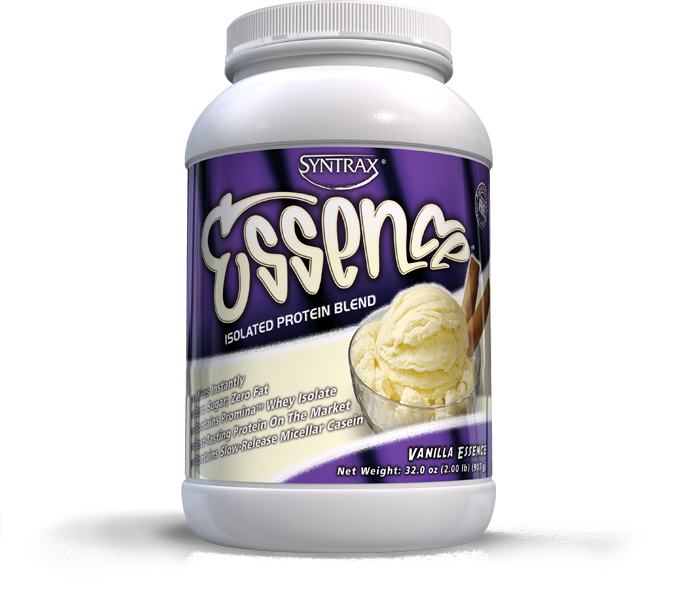 Since Essence™ contains slow (casein), medium (soy) and fast (whey) acting proteins, it is ideal for any situation. It has the ability to bombard lean body mass quickly with amino acids as well as provide the body with these same nutrients over an extended period of time.